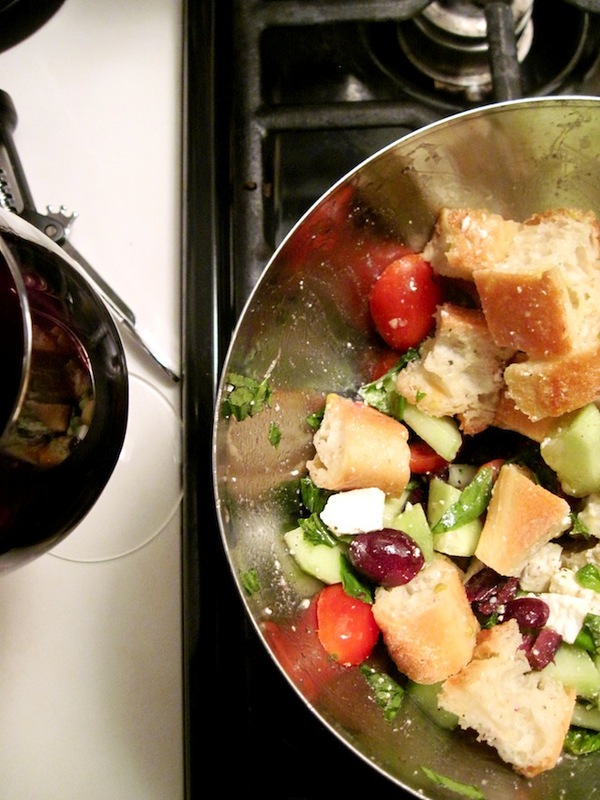 Where Manhattan Meets Dinner – Eat Me. Drink Me. I can see Manhattan from my roof. There is the dazzling slope of the Chrysler Building, the geometric cascade of the Empire State, and further to the left, the spanned wires of the Williamsburg Bridge. I was going through a rough patch a while back, and my favorite place to sit was on the roof, staring over the rooftops of Brooklyn at the Manhattan skyline and thinking of all the other people who were struggling with me. Each light representing a life. I’d sit alone, cradling a plate of pasta or bread with jam, balancing a glass of wine on the rooftop, and be silent and breathe. 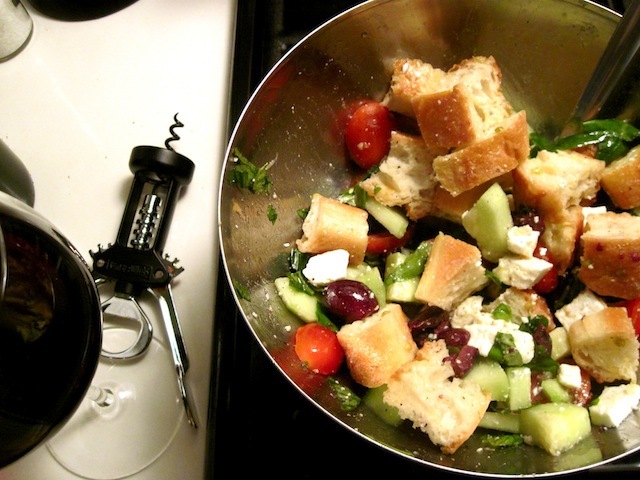 There was one bad night, where I wanted nothing but stillness, that I made myself a bread salad to eat on the rooftop. I had some leftover, almost stale baguette, and there’s nothing I’d rather do with stale baguette than add cherry tomatoes, basil, cucumbers, garlic, olive oil, rice wine vinegar, salt, and pepper to it. I put in extra garlic. There are advantages to eating alone. The roof is a good spot in times of peace, too. The skyline is stalwart whatever my case may be. There is the noise of the basketball games in the park, the ever present cacophony of sirens, planes, Latin music from the bodega on the corner. But underneath the calm of an unobstructed sky, the frenzy is at a comfortable remove. 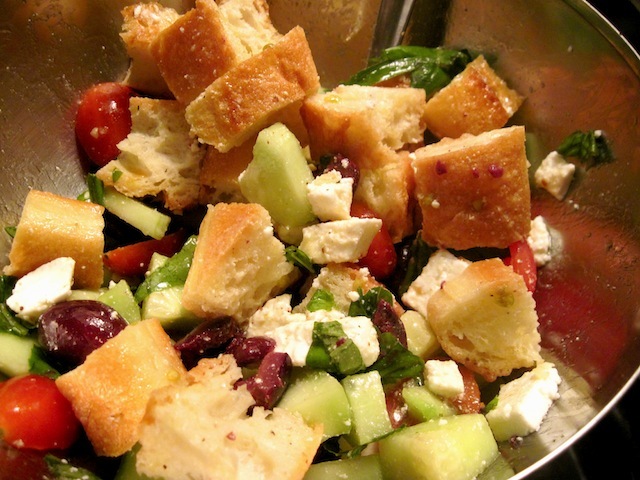 Tonight, I made a bread salad with French bread and plenty of garlic, even though I’m meeting people later. I took it up and watched the sun set. There’s a nook on the roof, a joint where the ledge covered in poorly spackled silver paint butts against the building’s edge. I sit here, my back against the wall, my feet propped up, gazing at the skyline as tacky and beautiful as a velvet painting. The sky, now the color of cantaloupe and blue, will soon be black – but the false black of a city sky where there are no stars. Manhattan twinkles at me, red and white lights against that blue and cantaloupe sky. While I sit in calm communion with New York, my bread soaks in olive oil and salt and garlic. I remember, that other night, I closed my eyes and sent out love to everyone who needed it. Because just then, for me, I had more than enough. Sharing your heart with your receipe made me cry. When you’re on that rooftop, I hope you always feel the love Grandpa and I send your way.